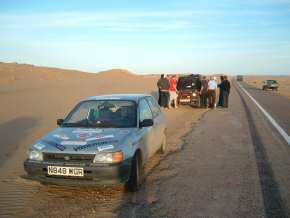 This is an account of Nick Capron and Tim Lovatt's journey from Cumbria to the Gambia during the 2006 Plymouth-Banjul Challenge. 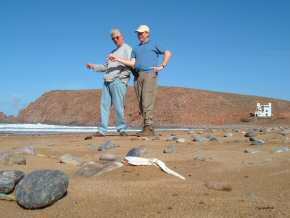 It is based on notes taken along the way, their photos and their memories. 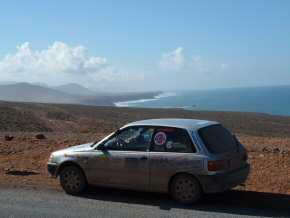 This page covers their journey from Spain across to, and through Morocco into the Western Sahara. Use the links at the top of the page to see other parts of their story, or to return to the Shap Ahoy Summary Page. Waiting in hotel of news about ferries. Playing cards & drinking coffee. Tim introduces Patrick and Steven to the game of 's--t on your oppo', a Royal Navy version of Contract Whist. Late morning, get the 'all clear'. 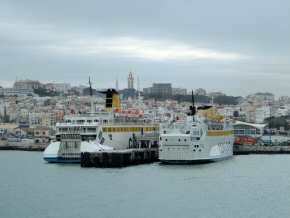 Buy ferry tickets at hotel & head off to catch the 1pm catamaran from Tarifa to Tangier, Morocco. After 2-hour queue (our first proper queue of the trip) and a bit of confusion, we were suddenly out of customs & passport control and heading southwards out of Tangier. First stop was forced upon us by the police, who enquired why Nick thought it necessary to drive through a red light. Luckily no fine or 'cadeau' (gift) was required. 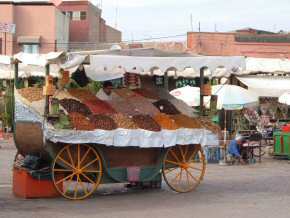 Next stop was Casablanca (after missing Rabat) to find a bed (ideally 2 beds) for the night. 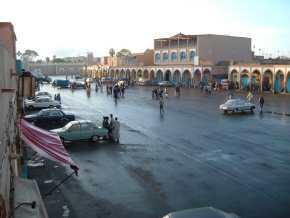 Hotel Mauritania was chosen on the grounds of friendliness and availability. Interesting bath & plumbing. The traffic pollution and driving techniques here are truly amazing. Every colour of smoke imaginable exudes for the rear (and sometimes the front) of vehicles. 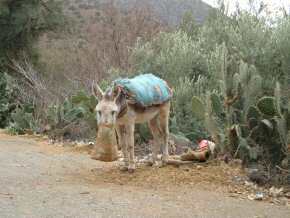 Donkeys and Mules adding to the confusion and mayhem. Extensive use of the horn seems to help everyone's progress. Woke at 5am to a cacophony of wailing from all the nearby mosques. 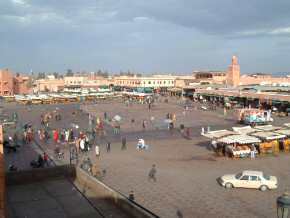 Destination today is Marrakech. Can't help noticing the large number of goats everywhere. Very red, desert-like landscape. 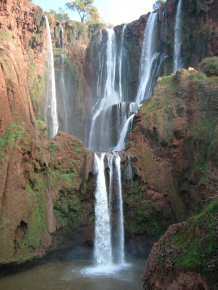 We decide to take a detour & visit some waterfalls (Cascades d'Ouzoud) that are featured in our 'Lonely Planet' guidebook. 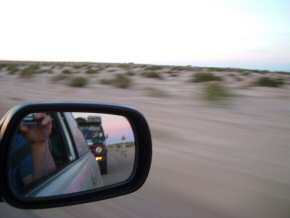 Some navigational 'confusion' leads us to consume more miles than intended but still worth the diversion. Heater setting now at minimum. Nearly killed by large lorry travelling sideways towards us after skidding (fully functional brakes seem to be an option on many vehicles here). 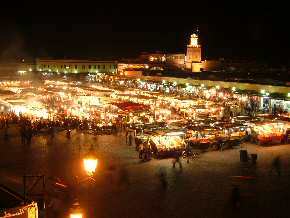 Arrive Marrakech at nightfall, after sorting out car parking from a moped mounted 'guide', we ensconce ourselves in the hotel CTM, right on the famous Djemaa el Fna (huge city square), inside the old Medina walls. Very basic but spacious room, with a bathroom worthy of inclusion in the 'interesting' section of our fictional 'bathrooms of Africa' handbook. Rust streaks on pipework are more prominent than the paint & flowing hot water is intermittent. Still, at £10 per night for 2 (including breakfast), no complaints. Traffic pollution here is almost on a par with Casablanca, just a higher ratio of livestock on the streets (which present an additional kind of pollution, potential for lots of skidding). 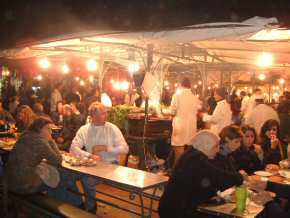 Marrakech is great, the place is packed and buzzing, fantastic BBQ food in square at night, incl. lamb, pork, fish, peppers, heads, brains & eyeballs. 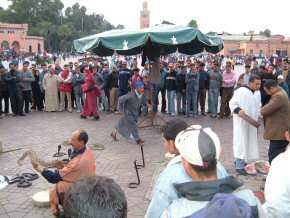 Entertainment provided by storytellers, musicians, snake charmers & traders selling things as diverse as fresh citrus juices, figs, nuts, false teeth, potions & elixirs. Tim now using earplugs to combat Nick's nocturnal serenades. Woke at 5am to a cacophony of wailing from all the nearby mosques & minarets (Tim's earplugs have fallen out by this time). 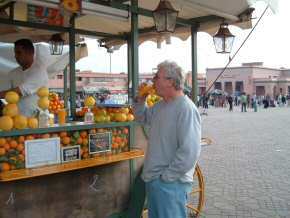 All day in Marrakech. Merry Christmas to all our readers! 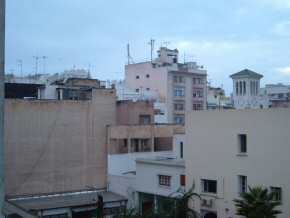 Breakfast on hotel roof overlooking the famous square. 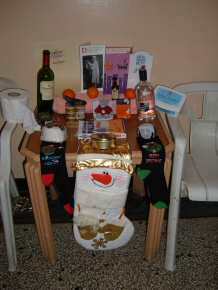 Opened presents & set them out in hotel room in lieu of Christmas tree & decs. Took tourist bus tour (British double-decker), very interesting but a bit expensive. Nick blocked toilet in our bathroom. No problem now with 'movements'. 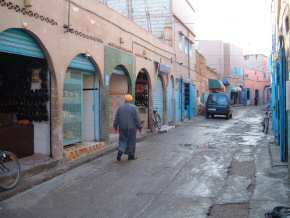 Checked out the Souks. Tim bought a Rolex for £4. 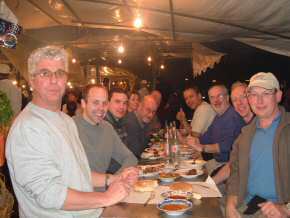 Met up with lot of the group in the square eating, and later at café on our hotel roof. 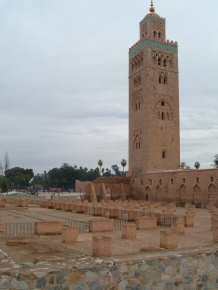 Woke at 5am to a cacophony of wailing from all the nearby mosques & minarets. 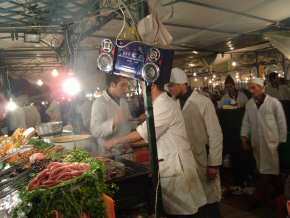 Bought dried apricots & fresh figs before leaving city, 1kg of each, this later proved to promote movements within the team. 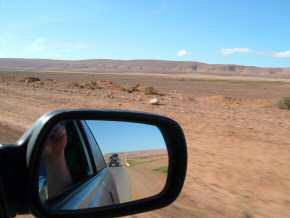 Departed Marrakech 10am. 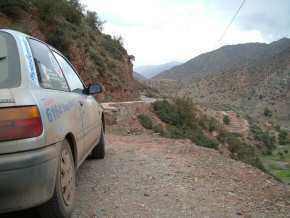 Heading due south up into the Atlas Mountains, through the snowline and over the Tizi n Test Pass at 2,100 metres (6,900 feet). Met up with various other challengers at café on top of pass. Sampled apricots & figs. Nick has definitely overbought on the dried fruit! Landscape changing from brick red to lush green, then to brown desert. Our overnight stop tonight is at Tiznit, a typical old town with mud walls. Ate tagine for supper. Hotel Touriste very friendly, clean and must be the bargain of the trip so far at £3.50 each or £4.00 if you include breakfast next door (not worth the 50p sorry to say). 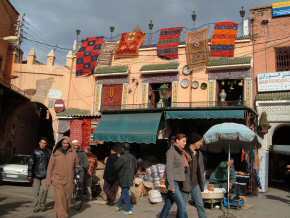 We toured the Souks, visited a silversmiths workshop where we both bought gifts for spouses - no expense was spared, we haggled to the last 50p. Tim found some fine hand made ladies slippers. 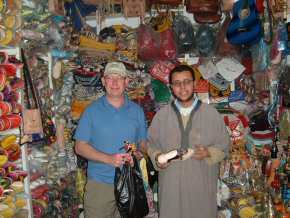 So pleased was the shoe vendor that he gave Tim a souvenir camel. Tim causes some panic in vehicle when the fund wallet is discovered to be missing - on return to the hotel it was still in the bedside drawer - really honest in this hotel and probably about the best we stayed in. 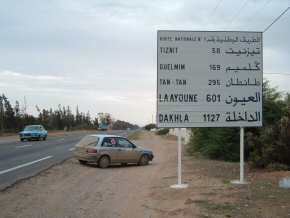 On way south again, target is Laayoune in Western Sahara. 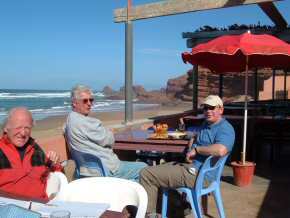 Taking diversion via coast road, stopped at Beach restaurant & hotel for extended lunch & beers, Auberge Sables D'or. There's camping here too, would make great overnight stop but too early for us. Pressing on south again the desert is fascinating, how it changes. 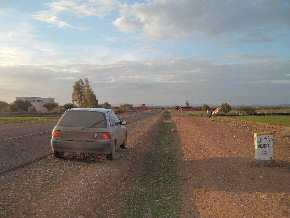 Easy miles on good tarmac till we hit a flooded waddi. 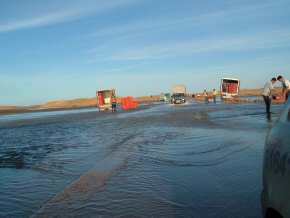 Flood in the desert? YEP! Cars & trucks strewn all over the place where they missed the causeway. We made it OK through the deep water thanks to Nick's skill and Bill's resistance to sucking in water. Come across Suzuki Jeep broken down with busted gearbox, one of the challenge vehicles 'The Lost Crusade' with Ross & Erika, no hope of it moving under its own steam so we take it in tow for the next 50km. A 'quick' 50k for them as we towed them at 70 - 80 kph. 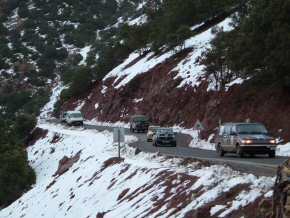 Before hitching up, we're nearly wiped out by a truck whose brakes lock up and catch fire as it passes us. Tim raises concern over Nick's rapid towing progress. It's dark when we find the next town but 3 Moroccans in a shed fix the jeep after stripping out gears, botching & reassembling in 4 hours. It now runs in fixed 2WD. 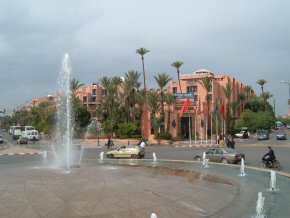 Make it to hotel at Laayoune port. 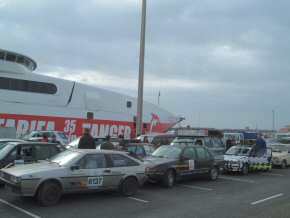 Modern & expensive, Spanish owned, mainly for port businessmen.